Still playing with my Prismacolor pencils today for Day 2 of The 30 Day Coloring Challenge. This time I’ve used some dark grey cardstock to make a one-layer card. Another floral image (swoon). Probably 90% of my stamps are florals. My love for flowers in the yard extends into my studio, especially since we have such a short growing season. Why not be surrounded by what you love year round? The image was heat embossed in white and then I got to work colouring. Instead of using OMS for blending, I used my white pencil. No sentiment this time. While I could have added one on vellum, sometimes it’s nice to have a few generic cards around for any occasion. It was finished with my usual smattering of sequins. Well hello, my lovelies! 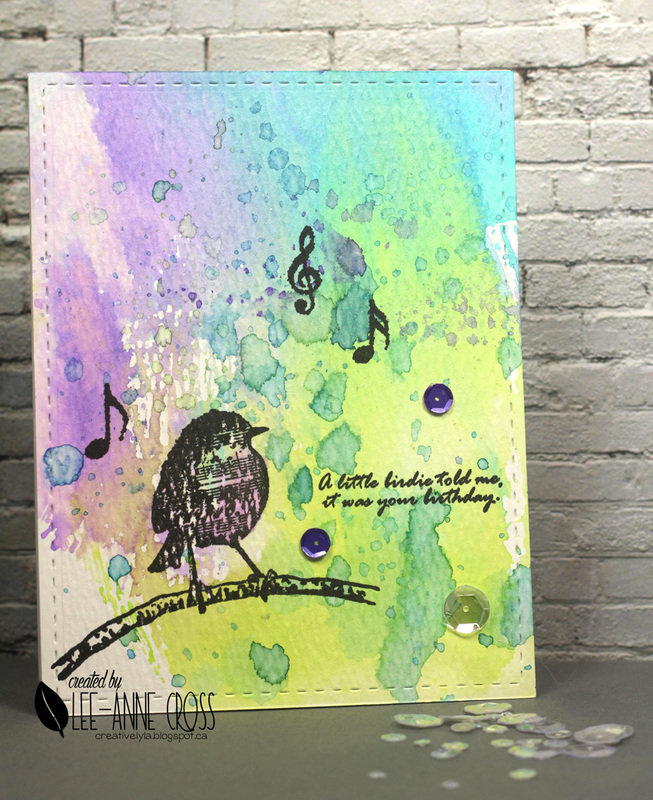 Today I am one of the designers helping Skipping Stones Design with their 7-day Blogs for Boobies blog hop and card auction! More than 60 designers are posting various cards and projects with all money raised going to the Susan G. Komen Foundation. Sadly it’s hard to find someone who hasn’t been affected by breast cancer. My mom lost her battle 20 years ago. She’s one of many relatives and special friends I’ve lost. I’m proud to be a part of this blog hop and fund-raiser in memory of those who’ve lost their battle and countless others who are currently battling breast cancer, and the many, many amazing survivors. You can help by shopping at Skipping Stones Design. Skipping Stones Design will be donating $2 per stamp set purchased between June 1 and June 14. They are releasing six new sets as well! Check out all their stamp sets right here. You can help by bidding on the auction items. Leave a comment below with your bid amount and your e-mail address. Only comments on this post will be eligible for this card auction. You MUST comment with an e-mail address to be able to bid. Sorry, but comments without an e-mail address are invalid. 2. Comments will post in chronological order, so you will be able to see the current high bid. 3. Return frequently to see if you’ve been outbid and to place a new high bid. 4. My auction closes at 8 p.m. Mountain Time on June 11. The winning bid will be the highest valid bid at the close of the auction. I will notify the winner by e-mail. Skipping Stones Design will send the winner an invoice for the amount of the winning bid. Once the invoice is paid, I will mail the set of cards to the winning bidder. Please pay your invoice as soon as possible so I can get these out to you quickly! You can help by spreading the word! The more people who know about this event, the more money we can raise. Please feel free to share this event with friends and family and/or on social media. Check in with the Skipping Stones Design blog each day of the hop for links to that day’s designers. And here’s my set of cards for you to bid on. You’ll receive the five cards complete with envelope, each wrapped in a sealed cellophane cover all mailed in a padded envelope. I’m totally into watercolor and these were simple and fun to make. 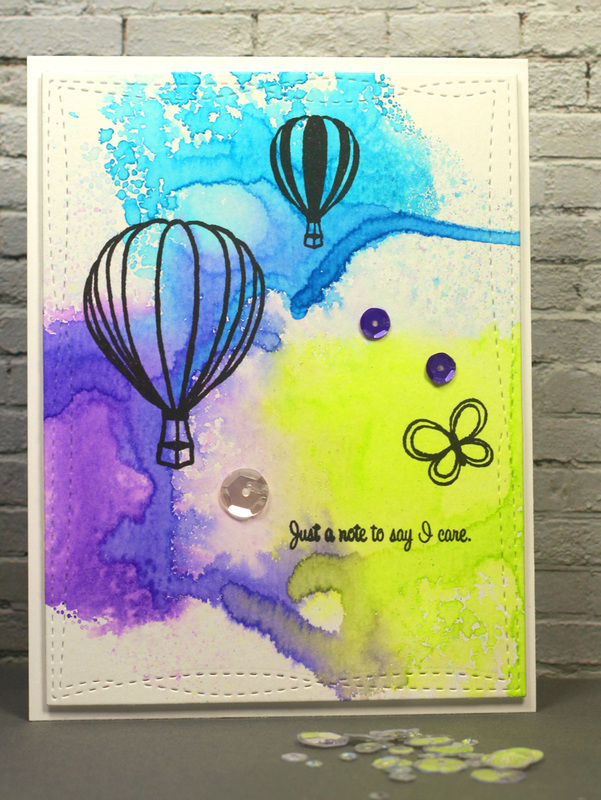 I used three different colors of Distress Inks on my craft mat and sprayed them with water. Then I dragged the watercolor paper through several times until I was happy with the colors and coverage. 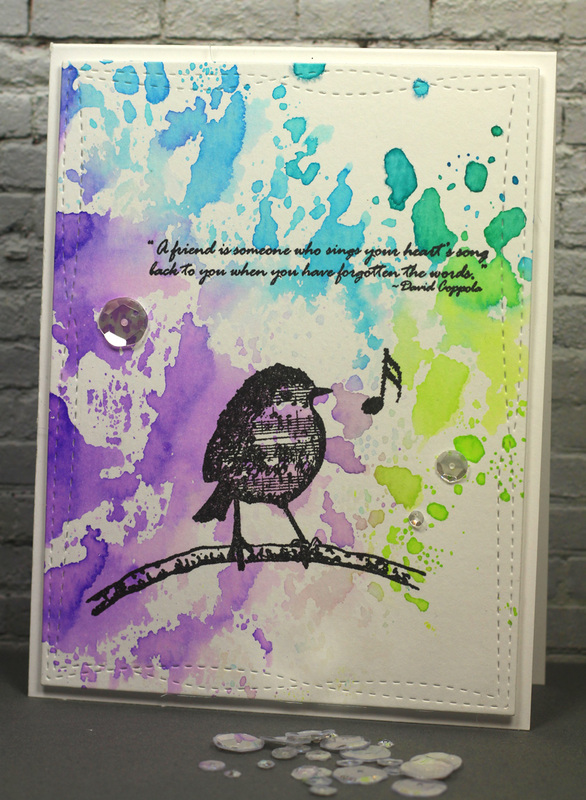 A little stamping with these gorgeous sets from Skipping Stones Design: Heartsong and Uplifting, a smattering of sequins or a touch of Wink of Stella and done! Well my lovelies, it appears it’s time for me to scale things back for a while. You haven’t seen much from me lately have you? I have recently been diagnosed with my third auto-immune disease. So it’s time to focus on my health. Lots of rest, physiotherapy, massages, meditation and just basically taking care of me. I’ll be spending lots of time in the kitchen cooking everything from scratch. Did you know there are some amazing auto-immune cookbooks out there? My research has led me to a few wonderful ones. And luckily I have a very support hubby who will be with me every step of the way. Since I’ll be doing all that…my time in my studio will be limited. This isn’t permanent…just wanted you to know that my posts will be very sporadic over the next while. You’ll see the odd post and next month I have a fund-raiser I committed to a while ago. Shery has very graciously offered to give me a leave from the STAMPlorations/ARTplorations team and I’ve gratefully accepted. Isn’t she the best? Author Lee-Anne Cross DesignsPosted on February 29, 2016 October 7, 2017 Categories UncategorizedLeave a comment on STAMPlorations Leap Year Sale! Saw the Card Concept Challenge today and just had to play along. Love the colors, love the flowers…and decided to do a “classy and elegant” design. 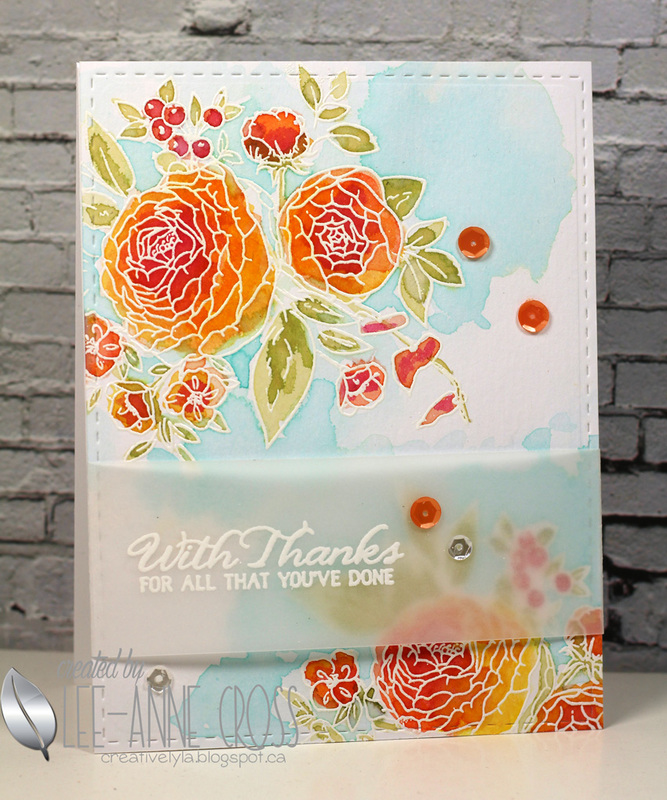 This gorgeous set from Wplus9 is called Beautiful Bouquets, Ranunculus. The flowers and sentiment are heat embossed in white. 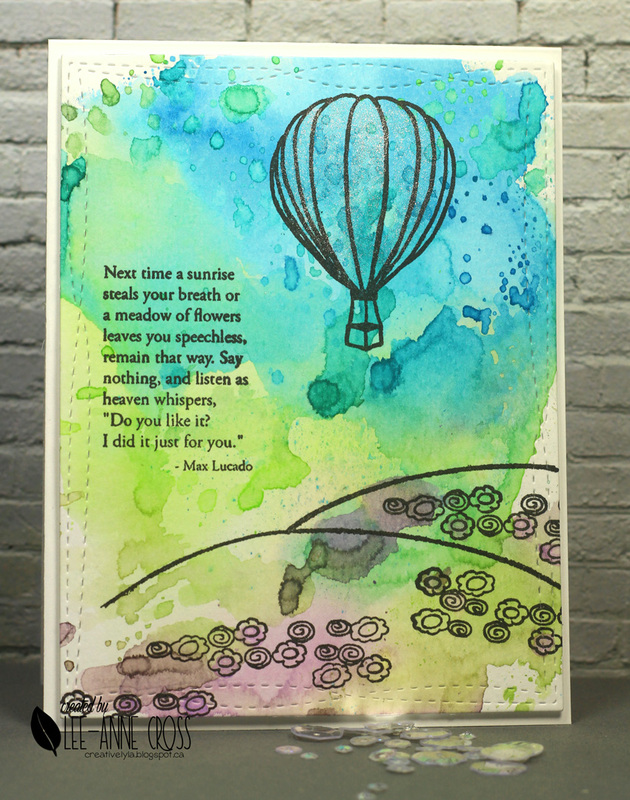 I’ve used Distress Inks and Zig Clean Color pens to do my watercoloring. A smattering of sequins and done! 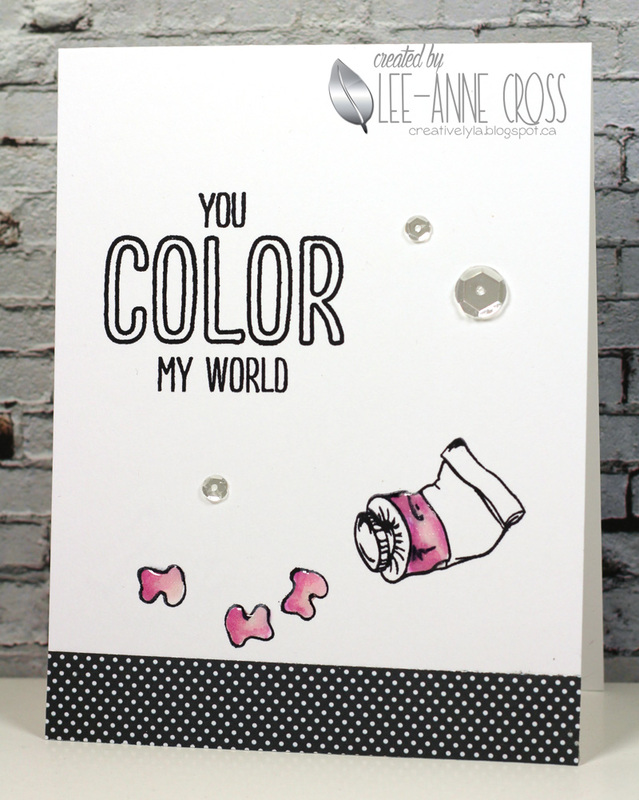 So call me crazy, but when I got this new set called Color My World from WPlus9, the first thing I thought of was making a mess! I thought of the paint going pop, splat, sploosh! Lucky you…you don’t get to visit my messy studio…sometimes there are indeed bits of this…blobs of that…I am such a messy artist. Added a bit of paper to the bottom of the card to anchor the design…and there’s Glossy Accents on the little paint blobs and on the tube of paint. Hello, my bloggy lovelies! It’s great to be back 🙂 Life has been getting in the way of art lately but here I am with my Tim’s tag for the month of January. Whew! Just in under the wire! 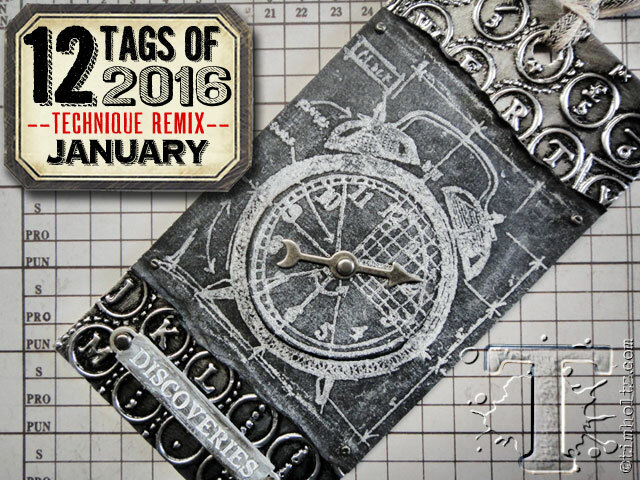 This year he’s doing a remix of various techniques he’s used over the years. This month it’s the chalkboard technique and the industrious metal technique. I’ve stayed true to the entire design, of course using what I have. 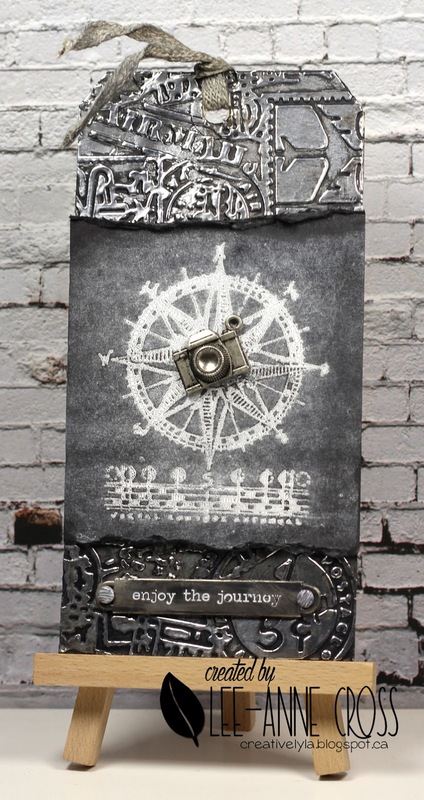 My sweet little camera is from his Souvenir Adornments, I’ve used one of his Metal Word Bands that has been aged with some Distress Paints. The stamp is from one his Stamper’s Anonymous Classics #1 and the embossing folder is called Airmail. You can find all the deets on how to create his tag right here.